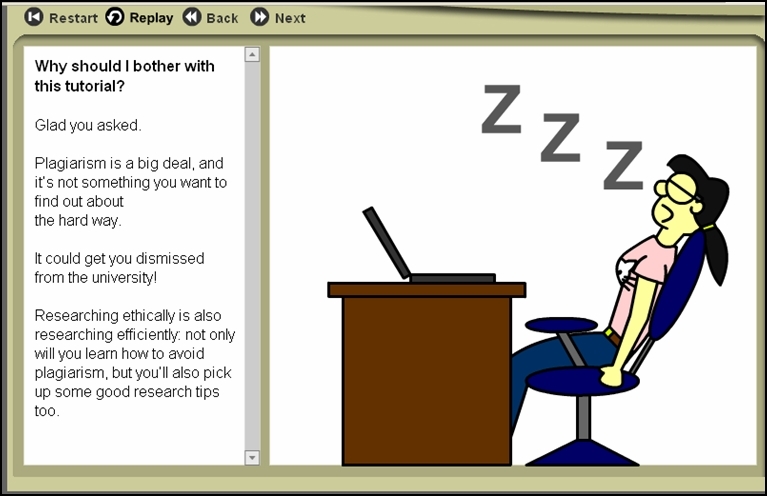 This tutorial from Vaughan Memorial Library provides an interactive overview of plagiarism and how to avoid it. duplichecker.com allows you to check your work sentence by sentence for directly plagiarized text. Indiana University's website has detailed instructions on how to avoid plagiarism. OWL Purdue has excellent tips for students to check for plagiarism with. Plagiarism.org is an excellent resource for simple explanation of plagiarism and how to avoid it. According to The Wadsworth Handbook: Ninth Edition, "Plagiarism is presenting another person's ideas or words as though they were your own" (Kirszner & Mandell, 221). In other words, plagiarism is theft. Sometimes, however, plagiarism is not intentional -- the author didn't cite correctly or know when citation was appropriate. You can avoid plagiarism by knowing how to cite and paraphrase correctly! In many cases, plagiarism is unintentional, and can be easily avoided by researching your subject before you write, keeping good notes of where you obtained your information. Many people find making notecards while researching to be helpful, others like to keep a word document with all of their citations. Pick a method that works for you. There are several online tools (i.e. Check Your Work) that can find exact word matches. This will help you cut down on accidental plagiarism. Make an appointment with the Writing Center, located in Greenwood Library. You can walk in any time during their daily hours and request assistance. The Writing Center will be able to help you avoid accidental plagiarism. Unfortunately, no online tool can help you avoid paraphrasing information or stop plagiarizing on purpose. This ethical decision is yours alone to make. The consequences of intentional plagiarism are steep; Longwood's Honor Code is enforced by the Longwood University Faculty, who turn in offending students to the Honor Board.